I look forward to St Herman’s as the best several days of the year – all thanks to the amazing people who make it happen: the generous donors and the hardworking organizers. Not a day went by in Albany when I wasn’t laughing so hard I cried. I felt like I knew where I belonged, and I smiled so much my cheeks hurt. Not an hour went by when I didn’t learn something new and amazing about my faith. At St Herman’s we share the most important things: our beliefs. There is no greater joy than praying, living, and going to church together with all the attendees around me. We grow together spiritually, feel for each other, and enjoy a sense of community. Here I can always find support and love, thanks to the friendships I’ve made and strengthened throughout the week of the conference. This past conference gave me wonderful memories that I will remember and smile about for years to come, like the moment I saw my childhood best friend at the airport for the first time in four and a half years. I’ve never run so fast or hugged someone as tightly as her. That week together strengthened our friendship immensely, and as soon as I got home, I bought a plane ticket to travel halfway across the country just to see her again as soon as I could. Every year I feel like a new person when I leave St Herman’s Conference. 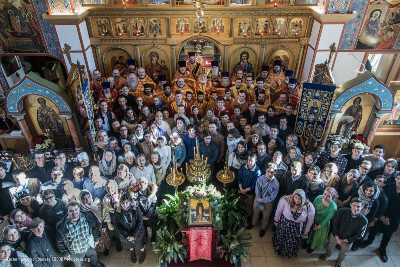 Each lecture, discussion group, and spiritual workshop has opened my eyes to the beauties of Orthodoxy, while also grounding me when I felt lost in life. I have sought out advice and comfort during difficult times from many of the clergy who attend conference every year, and they have helped me without even realizing it. I always learn something new about our faith and have learned countless lessons that help me strive to be a better Orthodox Christian in my life. Here, the best parts of ourselves are brought out as we strive for improvement in our earthly lives. It is a blessing to go to St. Herman’s every year. The conference has shown me that the Church will always be there for me, and if we live our lives in search of God, He will never abandon us. This is the reason for everything I love and do in my time on this Earth. You can’t even begin to imagine how much your life is going to change from the first walk through the hotel doors to joyful reunions to the final and tearful goodbyes. And when you look around and see 150 young adults crowded into the hotel lobby after checkout to sit around and talk for the next couple hours, waiting until the last minute to leave, it hits you. It only takes five days to change your life forever. Five days that turn into lifelong friendships, relationships that turn into marriages for some couples, and a new perspective on the world. Thank you from the bottom of my heart for allowing me to come to St Herman’s. You have changed my life. And I will never forget it.